Posted February 26th, 2018 by Lou Cristiano & filed under Promotions. Posted May 7th, 2015 by Lou Cristiano & filed under Uncategorized. It’s easy to request service: simply give us a call at 905-458-1021 or use our online service request form. We provide estimates for residents of Brampton, Mississauga, Oakville, Milton, Georgetown and Caledon, Etobicoke, Woodbridge, GTA. Northwest Gas is a fully licensed company specializing in sales, installation, servicing and repair of residential and commercial heating and air conditioning equipment. We have serviced the GTA’s heating and cooling needs since 1985. Our reputation is based on providing dependable superior quality products and service to the consumer at competitive prices. Northwest Gas will perform all work in a professional manner and will treat your property with the respect it deserves. With rising energy costs and instability in the energy markets, the benefits of a higher rated AFUE replacement furnace can easily outweigh the cost of the equipment over its lifetime. Also important to remember when selecting a new furnace is choosing carefully to ensure the equipment will stand the test of time. Be sure to arrange your ac cleaning and inspection before the hot summer days arrive. Posted August 5th, 2014 by admin & filed under Promotions. CARRIER Air conditioning units FROM $2,550 plus tax, Or rentals starting FROM $29.99 per month. CARRIER Furnaces FROM $2,600, Or rentals FROM $29.99 per month. Free Humidifier with the purchase of a furnace and air conditioner. Water Heaters FROM $1,200 plus tax Or rentals as low as $14.78 per month. 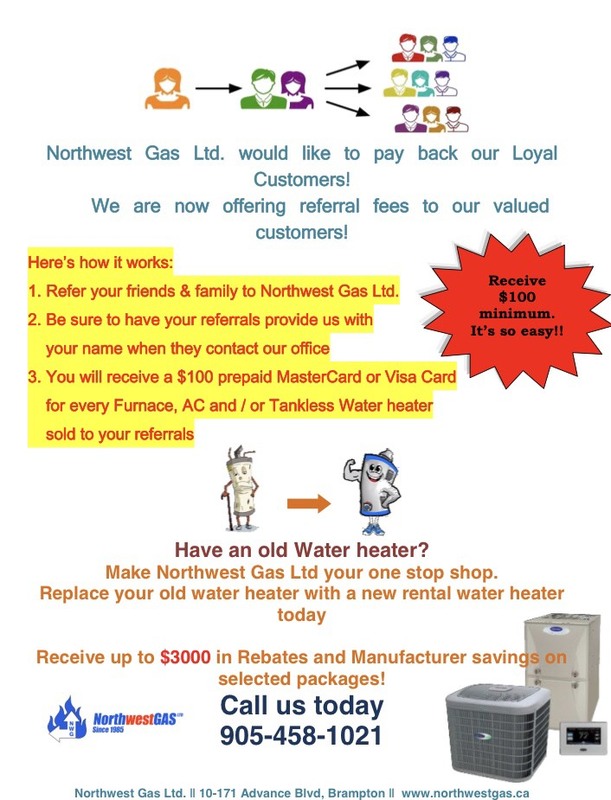 Northwest Gas Ltd. has the right equipment to fit your heating and cooling needs paired with Rental and Financing programs to accommodate your budget! Northwest Gas Limited, based in Brampton, ON, specializes in quality Furnace Repair & Installation, Air Conditioning Repair & Installation, Tankless Water Heater Installation, Humidifier Installation and more. All work is performed by experienced, licensed, professional HVAC contractors. Northwest Gas Ltd. proudly serves the GTA including Brampton, Mississauga, Oakville, Milton, Georgetown, Caledon, Toronto, Richmond Hill, Markham, Burlington, Etobicoke and Scarborough. Copyright © 2017 Northwest Gas Ltd. All Rights Reserved. Copyright © 2017 Northwest Gas Ltd.